This article is about the New7Wonders Foundation list. For other uses, see Wonders of the World. New7Wonders of the World (2000–2007) was a campaign started in 2000 to choose Wonders of the World from a selection of 200 existing monuments. The popularity poll was led by Canadian-Swiss Bernard Weber and organized by the New7Wonders Foundation based in Zurich, Switzerland, with winners announced on 7 July 2007 in Lisbon. The New7Wonders Foundation said that more than 100 million votes were cast through the Internet or by telephone. Voting via the Internet was limited to one vote for seven monuments per person/identity, but multiple voting was possible through telephone. Hence the poll was considered unscientific. According to John Zogby, founder and current President/CEO of the Utica, New York-based polling organization Zogby International, New7Wonders Foundation drove "the largest poll on record". The program drew a wide range of official reactions. Some countries touted their finalist and tried to get more votes cast for it, while others downplayed or criticized the contest. After supporting the New7Wonders Foundation at the beginning of the campaign by providing advice on nominee selection, the United Nations Educational, Scientific, and Cultural Organization (UNESCO), by its bylaws having to record all and give equal status to world heritage sites, distanced itself from the undertaking in 2001 and again in 2007. The New7Wonders Foundation, established in 2001, relied on private donations and the sale of broadcast rights and received no public funding or taxpayers' money. After the final announcement, New7Wonders said it didn't earn anything from the exercise and barely recovered its investment. The Great Pyramid of Giza, largest and oldest of the three pyramids at the Giza Necropolis in Egypt and the only surviving of the original Seven Wonders of the Ancient World, was granted honorary status. The New7Wonders campaigns aim to contribute to the process of uplifting the well being and mutual respect of citizens around the world, through encouraging interaction, expression opinion and direct participation by voting and polling on popular global issues which are understandable to everyone. One morning in June, Rio de Janeiro residents awoke to a beeping text message on their cell phones: "Press 4916 and vote for Christ. It's free!" The same pitch had been popping up all over the city since late January—flashing across an electronic screen every time city-dwellers swiped their transit cards on city buses and echoing on TV infomercials that featured a reality-show celebrity posing next to the city's trademark Christ the Redeemer statue. According to an article in Newsweek, around 10 million Brazilians had voted in the contest by early July. This number is estimated as the New7Wonders Foundation never released such details about the campaign. An airplane message, with a huge inscription "4916 VOTE FOR CHRIST" flew in Rio de Janeiro for a month. An intensive campaign led by the Peruvian Ministry of Commerce and Tourism in Peru had a great impact in the media and consequently Peruvian people voted massively for its national wonder. The announcement of the new World Wonders generated great expectation and the election of Machu Picchu was celebrated nationwide. The Chilean representative for Easter Island's Moais, Alberto Hotus, said Weber gave him a letter saying that the Moais had finished eighth and were morally one of the New Seven Wonders. Hotus said he was the only participant to receive such an apology. A campaign to publicize the Taj Mahal in India gathered speed and it reached a climax in July 2007 with news channels, radio stations, and many celebrities asking people to vote for the Taj Mahal. Queen Rania Al-Abdullah of Jordan joined the campaign to back Petra, Jordan's national treasure. There was a campaign on the news programs to encourage people to vote for Chichen Itzá. ^ "How the New7Wonders movement all began – World of New7Wonders". World of New7Wonders. ^ "The project founder Bernard Weber - A Short History - World of New7Wonders". World of New7Wonders. ^ a b c d e f g Dwoskin, Elizabeth (2007-07-09). "Vote for Christ". Newsweek. ISSN 0028-9604. Archived from the original on 2008-05-03. ^ "Voting Analysis". World of New7Wonders. Archived from the original on 2013-03-26. ^ "New7Wonders and UNESCO: Separate organizations, common goals". World of New7Wonders. Retrieved 25 October 2016. ^ a b "UNESCO confirms that it is not involved in the "New7Wonders of the World" campaign". UNESCO. July 9, 2007. Retrieved 25 October 2016. ^ "Interesting questions and answers". World of New7Wonders. Archived from the original on 2013-12-11. ^ "World Votes for New7Wonders". ^ "Sete Maravilhas: Brasil comemora eleição de Cristo Redent" (in Portuguese). Retrieved 2007-07-10. 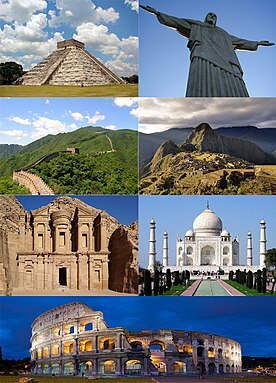 ^ "New7Wonders of the World". World of New7Wonders. Wikimedia Commons has media related to New Seven Wonders of the World.